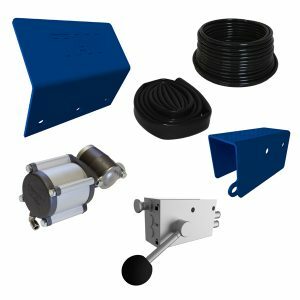 The TAV servo kit consists of the TAV5900 operating device kit and the TAV5800 servo cylinder kit. The order number for the TAV servo kit is TAV5850. The TAV servo can be installed on the TAV50/50D coupling heads. The servo cylinder kit can be installed on the TAV50/50D coupling heads already at the factory. Only the operating device kit then needs to be installed on the vehicle. The installation is quick and easy to do, due to the simple mounting procedure. The servo cylinder is installed directly to the mechanism, onto the crank axle, with two mounting bolts. The servo cylinder can be installed either on the right or left side of the coupling head. The servo kit is the same despite which side it is installed on (left/right). Mounting kit TAV5822 is required for installation on the left side.